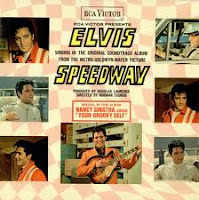 I was pleasantly surprised to learn (thanks to the Elvis Information Network) that the title track from Elvis' 27th film Speedway is a hit among the listeners of the radio station Sveriges Radio P4 Jönköping. This is one of the 25 local radio stations in Sweden that makes up P4, the most popular radio channel in the country. Apparently the station's morning show has an item on the program called Morgontoppen (loosely translated to The morning hit list), where the listeners can nominate songs and also vote for the candidates on the Internet. Each week the song with the least votes is kicked out while the best nominated song takes the fifth place. Who would've believed this possible? Well, I for one. You see, a couple of years ago I worked as a journalist at another local radio station, called Sveriges Radio P4 Halland, where a similar hit list was in use. I remember someone nominating "She Thinks I Still Care" and the pattern was the same as with "Speedway." Every week it got most of the votes and the number one spot. Finally the guys running the morning show decided that a song could only be at the top for ten weeks, then it had to go. My guess is that it will be the same old story when it comes to "Speedway." If they don't decide to change the rules it will be occupying the number one spot for ever. Such is the power of Elvis, that even his lesser known songs can hold their own against more classic songs by other artists. Guest Blog: "They Couldn't Put Diapers On Me"
Elvis Sings For My Baby Girl And Me Too!